The coming release of the Samsung Galaxy S10 means it’s decision-making time. Loyal fans are thinking about selling their previous generation unit and upgrading to the latest one. Meanwhile, those who simply need to replace their phones that conked out are mulling over buying the older model. Whether you intend to sell or buy a used smartphone, it’s worth knowing the price trends of the previous generation phones when their latest iterations are about to be launched. It can give you an idea of the best time to buy or sell a secondhand mobile phone. To give you a clear view of the best time to buy or sell, online classifieds giant OLX studied its data on the most sold phone brand in the world, Samsung. OLX examined the prices of used Galaxy S8 units when the S9 was revealed. The biggest online buy and sell platform also looked at the classifieds community’s interest (measured in views and inquiries) in secondhand S8 phone ads when its successor was about to be launched. “Intuitively, prices for older generation phones swiftly lose value after the release of a newer model. Our data support the claim. Through our in-depth analysis, we get precise insights on timing. As you know, timing is everything,” said OLX’s Head of Goods & Services Rambo Joinani. To get the best value out of your pre-loved phone, put it up for sale on OLX 30 days before the release of the latest model. Can’t let go of it that soon? Sell it on the date of the newest model’s release to spare yourself from a P700 price decrease when you vend it a week later. 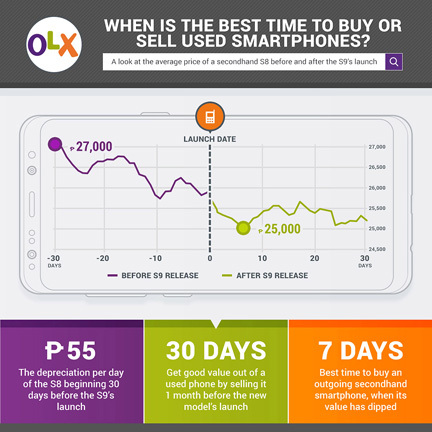 Inquiries on and views of used smartphones on OLX usually peak 20 days before the release of a new model. The interest starts to slow down 7 days before the latest generation phone’s launch. In general, the best time to buy a previous generation phone is 7 days after the launch date of the newest model. You can save as much as P2,000 by just delaying your purchase. If you’re upgrading to the 10th generation Samsung Galaxy S phone, consider selling your old phone on OLX, where you can reach thousands of potential buyers. In the market for a pre-loved phone? Search for a secondhand unit on OLX, where you can select from a wide selection of mobile phone listings. Visit https://www.olx.ph/.